After more than 50 long years chained near the popular tourist spots Shri Bhavani Museum and Yamai Devi temple in Aundh, Satara, Gajraj has finally been rescued from his chains. 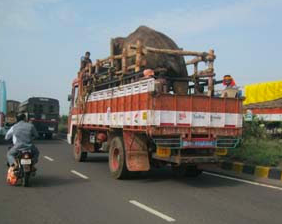 This old elephant, whose appalling treatment sparked a global #FreeGajraj campaign led by PETA India and its international affiliates, is on his way now to the Elephant Conservation and Care Centre (ECCC) in Mathura – a collaborative project of PETA India, Wildlife SOS, and the Uttar Pradesh Forest and Wildlife Department – to receive vital veterinary treatment and begin his integration into the company of fellow elephants after all these years alone. He was rescued by the Maharashtra Forest Department today and is being accompanied to the ECCC by an expert veterinary team. PETA arranged for the Wildlife SOS elephant-care centre to take him in, a collaboration, and PETA has paid for his new home and other costs. The Ministry of Environment, Forest and Climate Change has released three new Gazette notifications under The Prevention of Cruelty to Animals Act, 1960, to regulate dog breeders , animal markets, aquariums, and pet shops that sell fish. This progress has included a joint effort by animal protection groups including PETA India. PETA India was involved in the public consultation process for these rules and had provided useful comment to strengthen protections. The rules are the Prevention of Cruelty to Animals (Dog Breeding and Marketing) Rules, 2017; Prevention of Cruelty to Animals (Regulation of Livestock Markets) Rules, 2017; the Prevention of Cruelty to Animals (Aquarium and Fish Tank Animals Shop) Rules, 2017; and the Prevention of Cruelty to Animals (Care and Maintenance of Case Property Animals) Rules, 2017. In a perfect world, laws to protect animals would eliminate all cruelty, because dogs shouldn’t be bred and sold, cattle and other animals shouldn’t be sent to slaughter, and fish shouldn’t be kept in tanks. But sometimes change occurs in stages, and for now, the government has passed certain additional protections for dogs and fish as well as for cows, buffaloes, camels, and other animals who end up at animal markets. We also commend the government for helping remove animals from abusers through the Prevention of Cruelty to Animals (Care and Maintenance of Case Property Animals) Rules, 2017. • According to these new rules, dog breeders and owners of aquariums and pet shops that sell fish must register with the animal-welfare board of their respective states. • No aquarium can keep, house, or display “any cetaceans, penguins, otters, manatees, sea turtles and marine turtles, artificially coloured fish, any species of fish tank animals listed in the Wildlife (Protection) Act, 1972 (53 of 1972), or any species listed under the Appendix I of the Convention of International Trade in Endangered Species”. • The sale of camels and all types of cattle, including buffaloes, for slaughter via animal markets isn’t allowed. The sale of cattle and camels can be made only to a person who carries valid documents proving that he or she is an “agriculturist”. • Certain types of cruelty that commonly take place at markets will no longer be allowed, including hot branding and cold branding, mutilating animals’ ears, and force-feeding animals fluid to make them appear fatter in order to fetch a better price. Unfortunately, the new rules don’t prevent the dairy industry from continuing to supply animals to the beef industry. India’s beef industry is massive because its supplier, the dairy industry, is massive. Read more about the link between beef and dairy foods here. 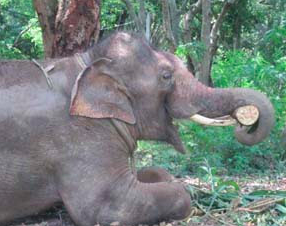 “The most exciting news of the month is that the nightmare is finally over for Sunder! For the past two years, we’ve been fighting to free this young elephant from a temple where he was used as a living begging bowl. He spent almost 24 hours a day immobilized by chains in a dark shed and lived under the constant threat of beatings from which he bore numerous scars. PETA affiliates worldwide launched campaigns to free him, and PETA India sued for his freedom and won. 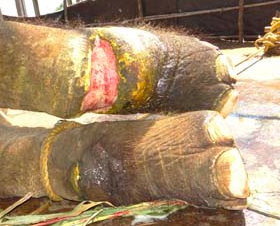 The court required that Sunder be released to a sanctuary, but the owner refused to comply and hid Sunder instead. Meanwhile, the owner’s allies used religious blackmail and political corruption to thwart efforts to free him. After months of sleuthing, Animal Rahat discovered where Sunder was hidden and released video footage of his beatings and injuries—the tight chains had cut deeply into his legs. This new evidence was the tipping point that caused the court to demand Sunder’s release. We arranged transportation to the sanctuary, and even then our crew was threatened by men who followed the truck on motorcycles and put nails under our tires to try to stop us.